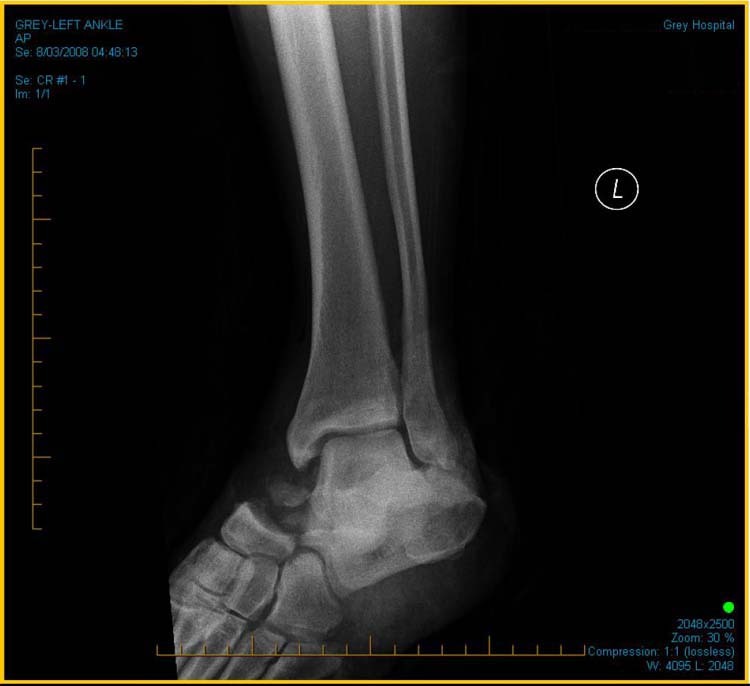 A case report describes a 21 year-old male who jumped off a roof and sustained a fracture dislocation of the talonavicular joint and associated lesser metatarsophalangeal joint (MPJ) dislocations. Attempts at closed reduction of the lesser MPJ dislocations were unsuccessful. Open reduction was performed and stabilized with k-wire fixation. This case illustrates the difficulty in attempting closed reduction of multiple lesser MPJ dislocation. The anatomical mechanism of injury and structures as they play a role in preventing successful closed reduction is reviewed. 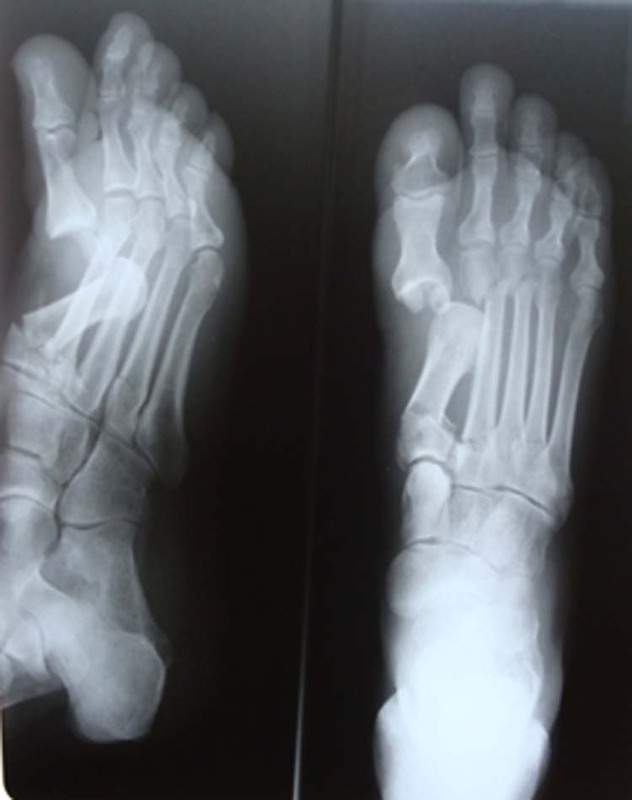 Figure 1 Left foot injury with Talar dislocation and talar head fracture. There is also an apparent dislocation of the great toe in the right foot. The great toe was reduced in the emergency department. He was then taken to the operating theatre to reduce and stabilize the talar dislocation. 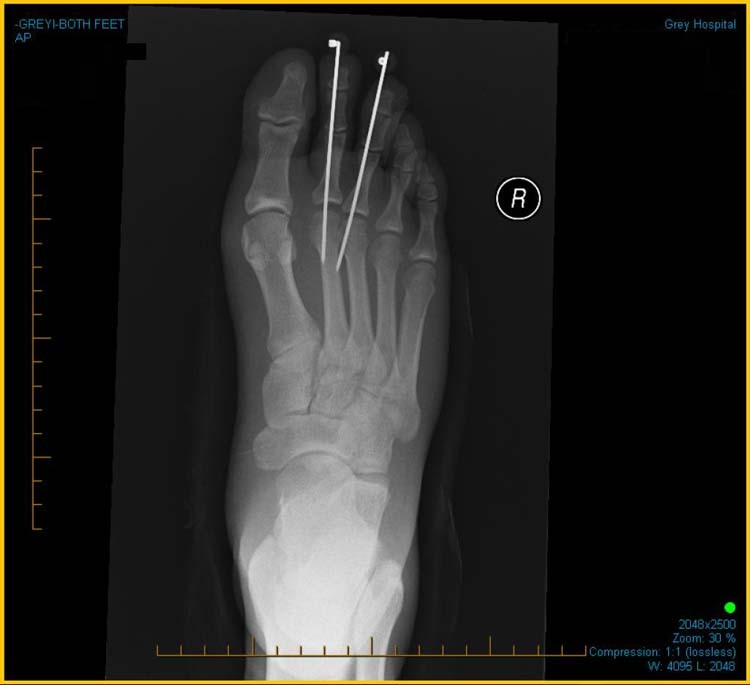 Figures 2AB Anteroposterior X-rays of the right foot showing dislocation of second and third metatarsophalangeal joints. Closed reduction was initially attempted by hyperextending the phalanges and by applying pressure against the bases of phalanges. Multiple attempts at closed reduction failed. 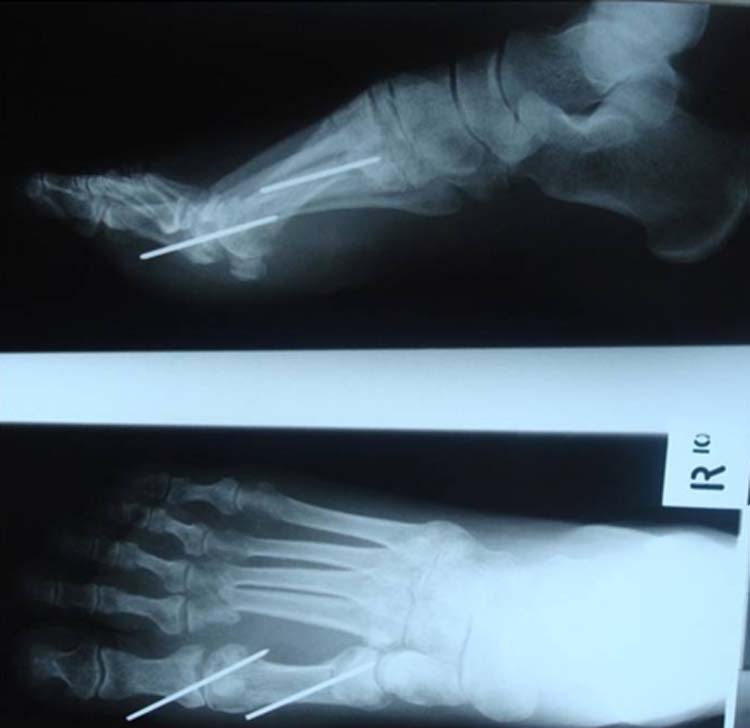 The metatarsophalangeal joints were exposed by making a dorsal longitudinal incision between the third and fourth metatarsals. 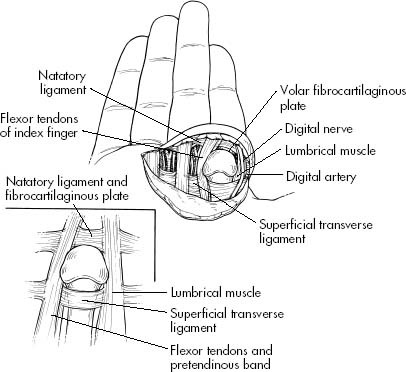 The extensor tendon was retracted and the anterior capsule was opened. The fibrocartilaginous plantar plate was found to be lying between the metatarsal head and base of proximal phalanges. 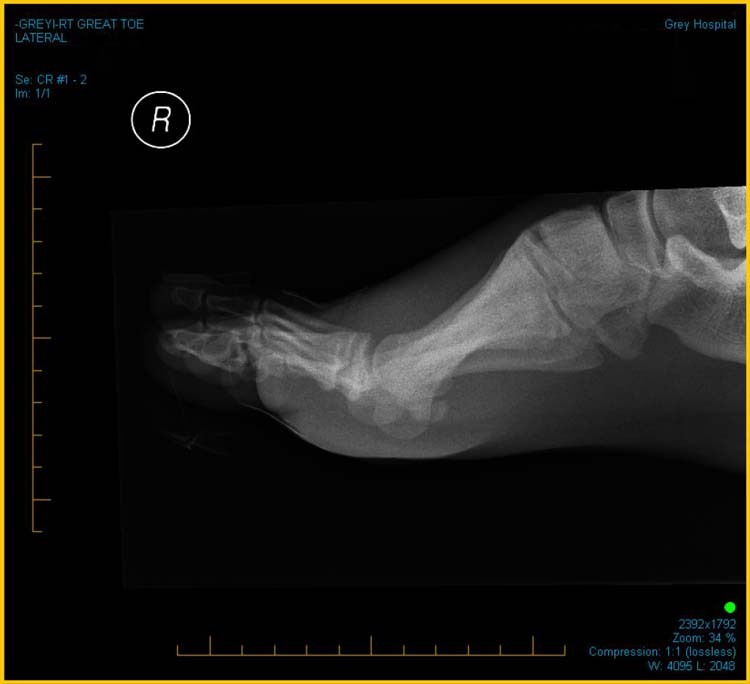 The flexor digitorum longus and flexor digitorum brevis tendons were found along the lateral side of the metatarsal neck and the lumbrical tendon was found along the medial side of metatarsal. An attempt at closed reduction was unsuccessful. The fibrocartilaginous plate on the plantar surface and the deep transverse metatarsal ligament on the dorsal surface of the neck of the metatarsal were divided. Figures 3AB Anteroposterior and oblique views of the right foot showing maintenance of reduction of the second and third metatarsophanalgeal joints. The foot was then placed in a short leg cast. Soon after the swelling had subsided, a walking heel was added and the patient was discharged encouraged to fully weight bear. The cast was removed in 6 weeks. The patient was asymptomatic and able to dorsiflex the toes without pain. The patient was last seen 11 months postoperatively when full range of motion was restored. Figure 4 MCP dislocation of the hand [Kaplan]. Metacarpophalangeal dislocations [Kaplan] occur most often in the index finger. 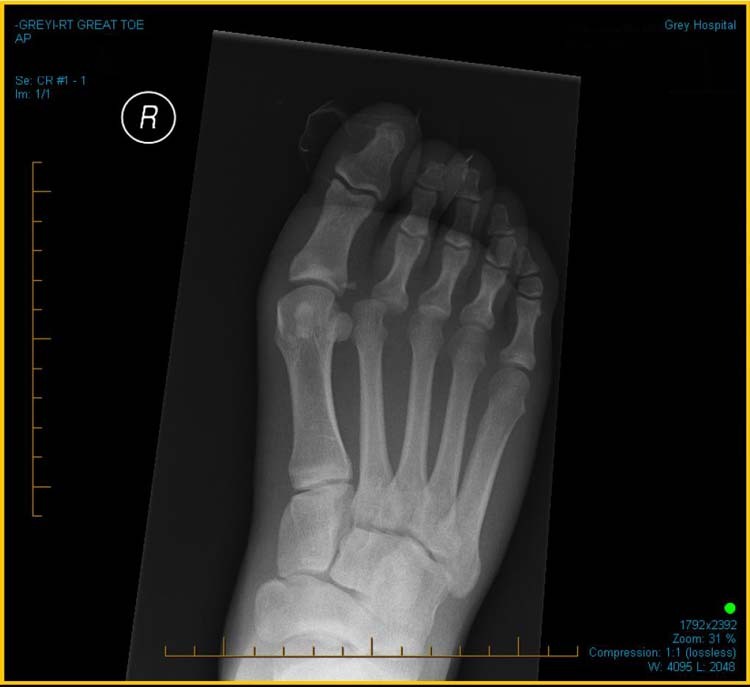 The configuration of structures around the metatarsal head makes closed reduction of the dislocation virtually impossible. The fibrocartilaginous plate and deep transverse metatarsal ligament and dorsal capsule have to be divided to facilitate the reduction of dislocation. This dislocation is easy to miss as the deformity may be subtle and patient may have significant other injuries. The patient may complain of less pain from the dislocation in the presence of other injuries. Careful radiological assessment and appropriate treatment is required. 2. Leung WY, Wong SH, Lam JJ, Ip FK, Ko PS. 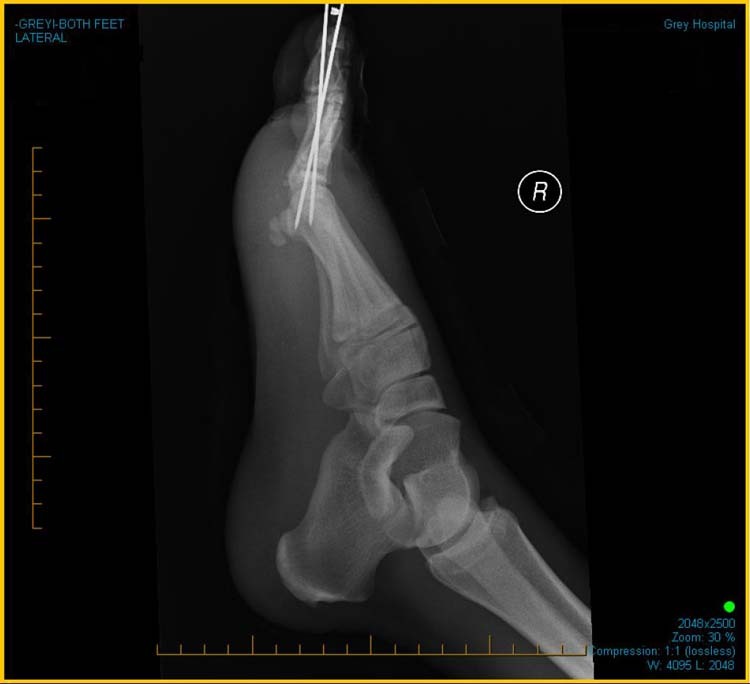 Presentation of a missed injury of a metatarsophalangeal joint dislocation in the lesser toes. J Trauma 50(6):1150-2, Jun 2001. 4. Kaplan EB: Dislocation of metacarpophalangeal joint. J Bone Joint Surg 39A:1081, 1957. Address correspondence to: Dr. Vasu Pai, MS, D (Orth), National board (Orth), FICMR (Orth), FRACS (Orth), MCh (Orth). Orth Consultant, Gisborne Hospital, NZ 00 64 27 276 5889, vasuchitra@gmail.com. 1Orthopaedic Specialist, Gisborne Hospital, Ormand, Road, Gisborne, New Zealand. 2Medical Student, Warwick University, Coventry, UK. 3House Surgeon, Middlemore Hospital, Auckland, New Zealand.